A beautiful bunch of glowing green grapes. I enhanced a bunch of green grapes by adjusting the lighting, shadows, brightness, and color. I went through a long series of effects and reduced the level of each one. While the overall effect is powerful, each individual filter only added a little to these great green grapes. In lesson 5 of the Learn and Master Painting course, we start by practicing with a gradient. I'm not going to bother photographing my gradient work. Then we learn how to make hard and soft edges of different types. The teacher shows many different examples of hard, soft, and lost edges and you can follow along and make your own. It is great how she takes painting step by step and I like how unlike a real class, I can go back - months later - and watch a section of the DVD painting video again. Lesson 5 ends with the painting of an evergreen tree with other trees merging in the background. Her evergreen tree is much prettier than mine, but I guess that is to be expected. In this painting she shows us how to use negative space around objects and we continue to practice varied strokes. We also learn massing to create the tree in the middle of the work. The autumn tree painting is part of lesson 4 of the Learn and Master Painting oil painting course that I got. It is a very complete course and if you are learning to paint, want to see how another painter works, or want to get started like me coming from another medium, I recommend it. In Lesson 4, the goal is to paint a believable object(tree with autumn foliage and shadow) and we are practicing varied strokes. In the DVD video, the teacher shows how to make varied strokes and explains how it is better to have varied strokes when painting. She also explains how edges should overlap instead of painting up to a line. It isn't clear in writing, but she shows different examples of good and bad edges so it is so easy to understand. My problem in this case is that while I do have Burnt Umber, I didn't have Cadmium Orange for the lesson. In fact, I didn't have any orange paint at all so instead of making a trip to the art supply store, I decided to see if I could make an orange like color mixing some of the other paints! I took a simple lesson and made it complicated, but in the end, I had my autumn tree with shadow and it did have autumn colors. When I finally buy Cadmium Orange, I'll make another painting of this lesson. I decided after finishing the tree that I wanted more than the shadow below the tree. Improvising beyond the lesson, I covered the ground with left over "leaf paint" from my palette. The mushrooms painting done in acrylic is one of my favorite paintings. It took several hours to do just like it would have taken me if it were a photo manipulation. I was trying to make a realistic painting with very recognizable mushrooms however I didn't want it to be as complicated as real life would make it so I simplified the background and I only painted a few mushrooms. I gave them brown-tan-white tops and white stems. The ground was simplified to a dark brown instead of the normal leaf and twig littler you'd probably expect to find in that setting. The trees in the background are simplified down to brown lines for branches and short wide strokes for leaves. 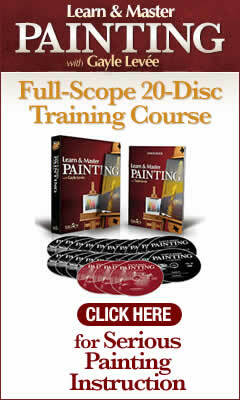 If you are interested in learning to paint, check out the Learn and Master Painting Course. I use it at home. 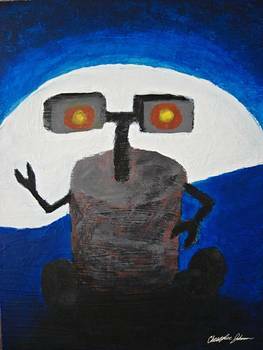 Moonrise on a distant plant is my second robot artwork (the first was a digital drawing), and I used acrylic paint. It wasn't part of the Learn and Master Painting course that I've been learning to paint with, but I did try to practice different strokes, brush technique, and color mixing as shown in the course. Unlike my previous works, I decided to first make a quick sketch outline of the robot basic shape and then I started painting over it in blocks finishing with the sky and moonrise. No, I didn't really try to keep inside the lines since the painting course doesn't show that as being correct. Instead I used my outline sketch as a guide and quite a few details changed as I worked. It was loosely inspired by a famous robot, but almost every aspect of this work is different from the robot that inspired it. Due to problems with my Internet provider I have several paintings to add to the blog. Enjoy! As part of the Learn and Master Painting course, I had to learn how to make different brush strokes. I couldn't practice the strokes exactly as instructed since I don't have an easel I can stand in front of while painting, but I tried. I later made a more free flowing winter tree branch artwork for fun with a smaller wood panel. 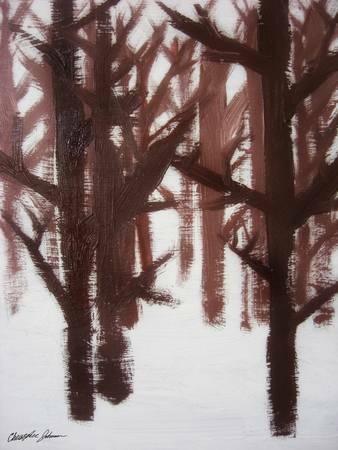 The study uses oil paint while the winter tree branches artwork is in acrylic. The colors are different in the works because even though the tubes show the same color, they are not the same. The burnt umber oil paint has a strong red tone while the burnt umber acrylic was more neutral. There is also some more variation in color because I added more white to the lighter trees in the acrylic version. I didn't feel I had enough contrast in the winter tree branches study. I am sure I will try some more of these in the future!